Will GOP Congress block an Obama Iran Nuclear Deal? WASHINGTON — With the deadline for an agreement on Iran’s nuclear program looming, the administration of U.S. President Barack Obama is under increased pressure to bring home a deal that is acceptable to a skeptical Congress. If he cannot do so by November 24, he faces an even tighter deadline to hammer out an agreement before a new, Republican-controlled, Congress convenes in January. “Already there was a tight deadline, and now a new political factor has emerged that even reduces the window further,” National Iranian American Council President Trita Parsi said of recent elections that put Republicans in control of both the House and Senate. The ascendant Republicans have warned of new legislative action that would impose new sanctions on Iran unless a deal to their liking is struck. And even in the event of a deal, Senator Bob Corker (Republican-Tennessee), the incoming chairman of the Senate Foreign Relations Committee, expects a bigger role for the incoming Senate in working out the details. “My guess is that there’s still going to be an appropriate opportunity for the Senate to weigh in, whether the White House wishes that to occur or not,” Corker told RFE/RL after a November 18 classified administration briefing on the talks. Corker was among 43 Republican senators this week who wrote a letter to Obama expressing “alarm” at the White House’s “reported plans to circumvent Congress” in the event of a deal. “We will continue to seek to impose additional pressure on Iran in the months ahead unless Tehran abandons its nuclear ambitions and pursues a genuinely constructive path in its relations with the world,” the senators wrote in the November 19 letter. Proponents of Congressional pressure say the threat of new sanctions legislation could result in greater concessions from Tehran in exchange for relief from international sanctions. Others, however, say a push for new sanctions by U.S. lawmakers could scuttle a deal altogether. “It’s a very dangerous game for Congress to be playing, to be throwing out additional threats of sanctions that could derail a deal before they’ve really even had a chance to see how it might play out,” John Bradshaw, executive director of the National Security Network, a Washington-based think tank, told RFE/RL. Fresh sanctions legislation may, in fact, be welcomed by Iranian hard-liners who “would be delighted to see Congress sabotage these talks and take the blame for it,” Parsi added. Republicans captured control of the Senate earlier this month, giving them a 53-47 majority in the chamber when it convenes for a new session in January and control of both houses of Congress. The power shift has increased the likelihood that U.S. lawmakers could pass bills slapping Iran with new sanctions, though it remains unclear if the legislation could reach the two-thirds threshold in both chambers of Congress to override a presidential veto. Senator Mark Kirk (Republican-Illinois) and Senator Bob Menendez (Democrat-New Jersey) introduced a bill late last year with 59 co-sponsors — including 16 Democrats — that would impose tough sanctions on Iran if a deal failed. The bill stalled in the Democratic-controlled Senate last spring amid intense opposition from the Obama administration, and Senate Majority Leader Harry Reid (Democrat-Nevada) has refused to bring the bill to the floor for a vote. Kirk told the “The Hill,” a newspaper that covers U.S. politics, that he will “definitely” introduce the bill in the upcoming Congressional session and that he is working on building enough support in the House to protect the legislation from a presidential veto. 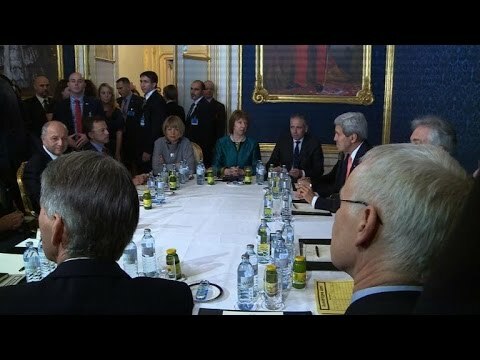 Tehran’s refusal to significantly reduce the size and output of centrifuges capable of enriching uranium to levels sufficient for use in nuclear warheads had been a key sticking point in negotiations since an interim agreement was reached between Tehran and the six world powers in November 2013. Any final agreement “must foreclose any pathway for Iran to develop a nuclear weapons capability” and “require Iran to come clean on its past work to develop a bomb,” Royce and Engel wrote in their statement. Obama does have some leeway when dealing with the deluge of sanctions first imposed by Washington after the 1979 Islamic Revolution. While the current sanctions regime is “arguably the most complex the United States and the international community have ever imposed on a rogue state,” the president “retains, in varying degrees, the authority to tighten and relax restrictions” under the laws that make up its “statutory basis,” according to a Congressional Research Service report published in February. But the threat of additional legislation to sanctions Iran could lead to a response by Tehran that could ratchet up tensions further and ultimately tie Obama’s hands in negotiations, analysts say. Even if the proposed U.S. sanctions and Iranian countermeasures are not overtly linked to nuclear issues to avoid being accused of torpedoing the negotiations, the end result could be the same, said Parsi. Erich Ferrari, a Washington-based lawyer who practices in the field of economic sanctions, said a drive by U.S. lawmakers for new sanctions could poison negotiations regardless of whether they become law.